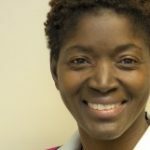 Terrie E. Ruff MSW, is a Licensed Master Level Social Worker (LMSW) works with the Starr Regional Medical Center as the Social Worker for the Senior Care Program Geri-Psych Unit. She is also an Adjunct Professor in the Social Services Department at Tennessee Wesleyan University. Terrie strives to be a “Beneficial Presence” in the lives of all she encounters and believes that her God-Assignment is found in 2 Corinthians 1:4. She has learned that when you understand how much God loves you, your life will be filled with joy and freedom beyond comprehension!